One of the ways in manufacturers are constantly trying to outdo each other is with the effectiveness of their image stabilization systems. These technologies can allow you to use slow shutter speeds in low light or at longer telephoto settings, which in turn saves you from having to reach for noise-inducing high ISOs. While all these systems work on similar principles, each one is slightly different, whether this is in terms of their effectiveness or the options a user can call upon through the menu system or lens. In the past few years manufacturers have also started to offer image stabilization built into camera bodies as well as in lenses. What follows is a look at how each of the main camera manufacturers implements stabilization technology across their camera and lens ranges. Note: It’s worth remembering that manufacturers tend to claim what these systems are capable of in certain conditions (at specific focal lengths, with a specific lens etc) rather than what benefit you're likely to see in every image. Canon has traditionally used lens-based image stabilization rather than applying the effect at the sensor level, and this is the case across its mirrorless cameras and DSLRs. This allows you to view the compensatory effects through optical viewfinders, which helps steady the view when composing images, and most current lenses promise correction of up to four stops (though some offer less). Canon IS lenses detect angular or rotational camera shake over horizontal (yaw) and vertical (pitch) axes and compensate for this by moving elements inside the lens. A few years ago, however, it developed a Hybrid IS system that was capable of compensating for shift (up/down and side-to-side) movements too. The fact that this kind of shake is particularly problematic when shooting close up explains why the technology first appeared inside a macro lens, although it has since found its way into other lenses, some of which are in compact cameras with close-focusing capabilities. Mode 3: A relatively new addition, this is similar to Mode 2 although it only fully activates stabilization at the moment of capture, which helps to save battery life. Many of these lenses also have the ability to sense when they' are being used on a tripod, so that they can deactivate stabilization automatically. More recent developments include Movie Electronic IS, which applies digital compensation over five axes when recording videos. This works with most of Canon’s lens range, save for a handful of wide-aperture and telephoto optics. Like Canon, Nikon has also continued with its lens-based system that first surfaced in the film era, which it calls Vibration Reduction. As such, it has the same advantage of its effects being visible in the viewfinder when you're composing images. The compensation it offers varies between lens models and their age. Some, particularly those with Nikon’s first-generation VR system, typically offer around 2.5-3 stops, but those with second-generation VR may offer up to 4 or 4.5EV stops. 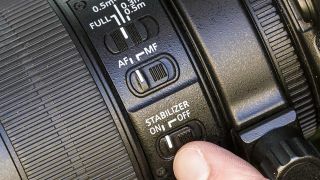 Unlike Canon’s ‘modes’, however, Nikon goes with different terminology for its various stabilization options. Current VR lenses may have two or more of the following: Off, Normal, Active, Tripod and Sport. Normal: This is the default option that’s equivalent to Canon’s Mode 1, although this typically also incorporates panning detection. This means you can use it when panning a moving subject without having to switch to a different setting. When set to this mode, a number of lenses will also be able to automatically detect that a tripod is being used. Active: Designed for photography from a moving vehicle or unstable surface, this is said to provide better correction and a more stable viewfinder image than would be otherwise the case. Tripod: Only found in a handful of telephoto lenses, this option is designed for use with tripods, but it doesn't simply disable the feature. Instead, it automatically detects the frequency of vibrations that come from the tripod (rather than normal camera shake caused by hand-holding) and only applies correction for these. Sport: Also somewhat rare, and confined to telephoto lenses used for sports, this is said to provide a more stable viewfinder image while also promising continuous shooting rates and release time lag similar to what you would expect with VR turned off. This mode also offers automatic tripod detection. Nikon also offers an electronic VR option for video recording, which has long featured on its compact models but was recently introduced in the D500 DSLR. This provides digital correction when shooting videos, and can be used with lens-based Vibration Reduction for even greater effect. Sony has traditionally used both sensor-based and lens-based image stabilization. Its previous DSLRs and more recent SLT models employed sensor-based image stabilization under the terms Super SteadyShot INSIDE and more recently just SteadyShot INSIDE. For its compact cameras, however, it has provided lens-based stabilization under the term Optical SteadyShot (OSS) – and this is also the case with its previous compact system cameras which lacked sensor-based image stabilization. Today, the situation is a little different. Sony’s most recent compact system cameras provide five-axis compensation (yaw, pitch, roll and shifting across vertical and horizontal axes) at the sensor level, so you can use this with unstabilized lenses and benefit from this effect. However, lenses with their own image-stabilization systems (marked OSS) are compatible with image-stabilized bodies too. In this scenario, the camera will continue to correct for shifting and roll, but will have the lens correct for pitch and yaw movements.